This article is no longer up to date and needs to be updated with new information from Halo: Shadow of Intent. You can help by updating this article. "Glory and honor guide our ascension." The Sangheili Rangers are a specialized Sangheili unit in the Covenant, its post-war remnant factions, and the Banished. Within the first Covenant Empire, they were organized under Fleet Security, a division of the Covenant Special Warfare Group. Experts in extra-vehicular space and aerial combat, the Rangers are a threat to ships, stations, as well as many other types of flightcraft. Before the Great Schism, Sangheili Rangers were an all-volunteer force. While some joined for personal glory or ancestral duty, they each know that a gruesome end could await them from even the most inconsequential of injuries. Normally deployed as an expeditionary force during limited naval engagements, it is they who choose which craft are to be boarded and which destroyed. Experts in both zero-g combat and demolitions, they have been the bane of many a ship. Rangers also perform HAZOP operations and traditional scouting roles. As part of the Covenant's Fleet Security, the Rangers were tasked with the security of a fleet. This placed the Rangers in a defensive role, such as removing foreign forces from entering and/or commandeering the ship. The Rangers can also perform offensive roles such as space insertion and demolition tasks. Sangheili Rangers are combat experts in environments with little or no gravity. However, they are commonly deployed planetside during engagements. A Ranger's ease of mobility poses the greatest threat to his opponents on a world's surface. Sangheili Rangers have served since the dawn of the Covenant. Sangheili Rangers were deployed during the Covenant's attack on the human colony planet Reach. During the later stages of the Siege of New Alexandria, a team of Sangheili Rangers entered the New Alexandria Hospital shortly after SPARTAN-B312 destroyed a Covenant communications jammer. They attempted to kill the Spartan, but were ultimately killed by the supersoldier. During their attempts to seize the Forerunner artifact located under SWORD Base, the Covenant deployed many Sangheili Rangers along with other troops to attack Dr. Catherine Halsey's laboratory, but all were slain by the defending SPARTAN-IIIs of NOBLE Team. Several were also present at the Aszod ship breaking yards. Near the end of the battle, a large contingent of Sangheili Rangers was dispatched to the UNSC Circumference along with their Kig-Yar counterparts in order to retrieve the ship's NAV database. They were stopped by SPARTAN-II Blue Team, but not before causing the presumed death of one of its members. During the opening stages of the Battle of Earth, Sangheili Rangers were among the forces deployed to a cluster of orbital defense platforms above Earth to destroy them with antimatter charges and tip the battle in favor of the Covenant fleet. They were successful in destroying two of the platforms but were prevented from destroying the third due to the intervention of a SPARTAN-II soldier. Upon his arrival at Installation 05, the Prophet of Regret deployed his forces onto the surface of the ringworld. Among these forces were Sangheili Rangers. They were unable to prevent the Hierarch's assassination at the hands of the Master Chief. Later in the Battle of Installation 05, when the Sangheili were cast out of the Covenant and civil war broke out on High Charity, many Sangheili Rangers aided their species in their fight against the now Jiralhanae-led Covenant forces. With the Sangheili no longer in the Covenant, their role as aerial infantry units was taken by the Jiralhanae Jumper. Jumpers were equipped with jump packs that, rather than allowing complete aerial maneuverability, gave them the ability to make large jumps across the battlefield. The Yanme'e also continued to serve in the Covenant as aerial units. After the Human-Covenant Wars conclusion, the rank of Sangheili Ranger continued to see use in several remnant groups of the original Covenant. The faction lead by Jul 'Mdama utilized Sangheili Rangers, along with their Unggoy and Kig-Yar counterparts in many engagements. A group of Sangheili Rangers were deployed to the exterior of the Forward Unto Dawn when the ship drifted into proximity of the Forerunner shield world Requiem in order to prevent any humans from entering the planet. They were also part of the contingent of Covenant troops taking part in the attack on the research facility located in an asteroid belt near Installation 03, under command of the Ur-Didact, who was searching for the Composer on board the station. While all Covenant attackers were slain, the Didact was successful in locating the Composer and using it on the stations human inhabitants. Sangheili Rangers continued to see actions on the shield world of Requiem as part of the unified Covenant-Promethean resistance to the crew of the UNSC Infinity during the conflict on the planet during February-March 2558. One of their most notable deployments was as part of the massive boarding action conducted against the UNSC ship towards the end of the battle. Sangheili Rangers were deployed to the Argent Moon, a derelict ONI research and development station later in the year in search of supplies in order to aid the Covenant in their ongoing war with the Swords of Sanghelios. They were stopped when a team of SPARTAN-IIs scuttled the station. Many Sangheili Rangers helped the remnants of Jul's Covenant in defending their final stronghold, Sunaion against the combined forces of the Swords of Sanghelios and the SPARTAN-IV Fireteam Osiris, but were defeated and ended up being hunted to the last by the Arbiter's forces. Sangheili Rangers also serve in the mercenary group known as the Banished. These forces were part of the massive Banished deployment onto Installation 00 in 2559. The Sangheili Rangers of the Banished served as marksmen and skirmishers, rather than extravehicular combat specialists. The Rangers wear hermetically sealed combat armor that would allow them to work in the vacuum of space or other similarly hazardous environment. In addition to this, the Rangers are equipped with either an antigravity pack or a thruster pack, providing them greater mobility. The armor of a Sangheili Ranger allows them to operate in gravity and oxygen-free environments, but the thrusters on their armor are specifically designed for mobility in gravity-intensive environments. 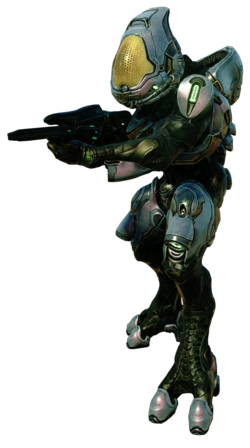 Like most Sangheili units, the Rangers utilize plasma rifles and plasma repeaters as their standard armament. On some occasions, Rangers within the original Covenant would use the focus rifle and the needle rifle. Lodam Armory also produces a combat harness for Rangers, based off their harness for Covenant Storm units. The Rangers will use their thruster packs to great effect in battle, using them to strafe while firing their weapons. In Halo 2 and Halo: Reach, their energy shield strength is similar to that of a Sangheili Minor. For combat, they are often seen dual-wielding plasma rifles (Halo 2) as well as using suppression rifles such as the focus rifle and the needle rifle. Ranger armor is colored cyan in Halo 2 and grey in Halo: Reach. Description: Glory and honor guide our ascension. In Halo 2, the Rangers' combat armor design was a combination of the Flight harness and the Assault harness. This design was changed significantly in Halo: Reach where they now have their own unique armor design to distinguish themselves from the rest of the Sangheili units. This was carried on in Halo 4. Rangers in Halo: Reach wear a new type of helmet, bearing some resemblance to the MJOLNIR EVA helmet. This helmet may be the type worn by Rangers in Halo: The Fall of Reach, as the novel describes them as having transparent visors. It is quite possible that the armor types featured in Halo 2 and Halo: Reach are used synonymously by Rangers, as the one in Halo 2 seems more for low-altitude combat, whilst the armor seen in Halo: Reach appears to be designed for high-altitude and exoatmospheric combat, with a vacuum-sealed helmet and suit similar to the MJOLNIR EVA equivalent. They now have their own armor design, capable of distinguishing them from the rest of the Covenant units. They are a playable class in multiplayer and matchmaking. They now use a wider range of weapons, including plasma repeaters, needle rifles, focus rifles and concussion rifles. They are now equipped with thruster packs, restricting them to low-altitude flight. Their visors are transparent, leaving the face fully visible. Their armor comes in blue, white, and gray. They are often seen leading Kig-Yar Rangers and Unggoy Rangers. The armor has four extra thrusters above the wrists and kneecaps. Sangheili Rangers are anti-infantry units armed with T-51 carbines that can be built by every Banished leader at the Raid Camp. Unlike Rangers in other games Banished Rangers do not use jetpacks, and are not equipped with energy shields. In Blitz Rangers cost 30 energy while Assault Rangers cost 50 energy. They come in pairs unlike UNSC snipers, who are deployed alone. In Halo 2, the Rangers' eyes can be seen through their helmets' eye pieces. In Halo 2, while firing, a Ranger wielding one weapon will have both hands affected by recoil, as if holding two weapons. This is probably because they often wield two plasma rifles,and the game does not support an animation with only one weapon. In Halo: Reach, dead Rangers (or a player with this armor permutation) will have their mandibles protruding from their faceplate. In Halo: Reach, there are special gold/yellow-armored Rangers known as BOBs. In the post-game carnage report, they are listed as Covenant vehicles. A Sangheili Ranger in combat in Halo 2. A Sangheili Ranger standing still in Halo 2. Alternate view of a Sangheili Ranger charging in Halo 2. Halo ActionClix model of a Sangheili Ranger. A Sangheili Ranger with a focus rifle in Halo: Reach. A Sangheili Ranger standing still wielding a plasma repeater in Halo: Reach. A Sangheili Ranger strafe-running in Halo: Reach. A squad of Sangheili Rangers. Concept art of a Sangheili Ranger's armor in Halo 4. An untextured model of the Halo 4 Sangheili Ranger. Model of a Sangheili Ranger in Halo 4. A Sangheili Ranger in Halo 4. Another view of a Sangheili Ranger in Halo 4. A pair of Sangheili Rangers in Halo 4's Spartan Ops. A Sangheili Ranger in Spartan Ops. Concept art of Ranger helmets for Halo 2: Anniversary. Final render of the Ranger helmet for Halo 2: Anniversary. A Sangheili Ranger from Halo 2: Anniversary. A Sangheili Ranger in Halo 2: Anniversary. A Sangheili Ranger in Halo 5: Guardians. A Sangheili Ranger on Escape from ARC. A Sangheili Ranger on Sanghelios. Sangheili Rangers with Unggoy Rangers on Attack on Sanctum. A Sangheili Ranger activating his thrusters in Halo 5: Guardians. Kola 'Baoth in Swords of Sanghelios Ranger armor. The Ranger harness in Killer Instinct. Sangheili Rangers in the Halo Wars 2 Open Beta. Rangers fighting Marines in Halo Wars 2.